The Dwarves of Erebor are back and with a fiery bang of a visual chef-d'oeuvre portraying the terrible Smaug- The dragon. The second installment to J. R. R. Tolkien's master piece in the middle earth, the quest to regain the Dwarves homeland leads them into another amazing adventure through majestic land where different forces start to conjure with darkness concealing the truth. Peter Jackson has yet again managed to take a novel and make the characters come in to life in an appealing way. A year ago, Bilbo Baggins and the Dwarves along with the Wizard had walked into the unknown, yet filled with an unprecedented adventure. The Desolation of Smaug, starts with flash back of Gandalf meeting with Thorin in the Prancing Pony, where we’ve already been in the first part of the Lord of the Rings Trilogy, which isn’t actually included in the “Hobbit” the book by Tolkien. Lots of new things have been added into the movie but as a huge admirer of Tolkien his novels, I’m still satisfied with the changes. The main, as I think started when Peter made Hobbit into a trilogy. The book is not that long and yet is interesting at the same time. But as it seems Jackson had to add a lot of details so that he could turn it into a trilogy. But again, he has managed to bring everything to life and even the added details seem to fit right into the story. The adventure beings shortly after the meeting of Thorin and Gandalf. Starting at the same point where we left the company last year- Azog the defiler still on their tails. Then comes another important character which seemed a little different in the book and the meet is modified as well. The surprising part is the addition of a different character Tauriel, a fictional character within the fiction. She’s not the only character not mentioned in the book! Legolas the prince of Mirkwood whose identity remains disclosed in the book appears in the movie and has a very long part as well, along with a fight that doesn’t happen in the book. But again, Jackson as managed to make it look almost as it has been brought right out of the text. Not only has Jackson introduced a new lady character Tauriel, but he also made her fall for Kili, and a Love triangle with Legolas having a silent crush on Tauriel. Over all the adventure part remains the best bit of share in the movie. The barrel escape is the best part with addition fight, it just comes alive out the text book, which actually doesn’t happen and also, in the book the Lids are closed. Not only that the biggest change made in the movie is the part with Smaug. The movie portrays a conversation and confrontation between Thorin and Smaug which doesn’t happen in the book. Only Bilbo chats with the dragon, afterward joining the Dwarves Company while Smaug the terrible goes on to destroy the Village. Lots of modification has been made in the last part, again it doesn’t destroy the essence of the novel but kind of adds more life into it. Since, Jackson decided to go with a Trilogy, these extensions are kind of expected but they are surprisingly well. Million times better than Ron Howard’s adaptation of Dan Brown novels and modification introduced into the movie. 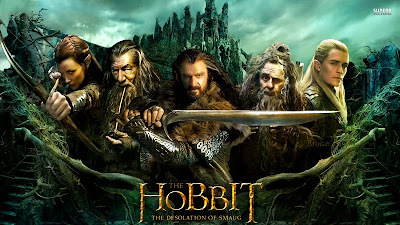 The movie is a masterpiece; well a diehard fanatic of the Hobbit and Lord of the rings book will definitely love it. But speaking from a non-fan normal movie audience, they might kind of thing that it’s been exaggerated a lot. And there’s no point in criticizing the fights which are not realistic or extremely unrealistic, because it’s a taken from a fantasy novel, and even though it’s not in the novel it’s a fantasy movie and that’s normal for the genre, and again it’s awesome! You’ve got agree on that! For a mythical, fantasy and adventure packed movie, you couldn’t ask for anything better than this! The only bad thing about the movie was that it ended, and no one wanted it to end the way it did. I guess we’ve got to wait for another end for the main part. At the end of the day, Peter Jackson never disappoints me! I suggest you all to watch the movie once or twice if you want! It’s worth it! And if you can’t wait for the movie, read the book! It short and overwhelming!